I hiked up Sugarloaf Mountain in Heber Springs, Arkansas. 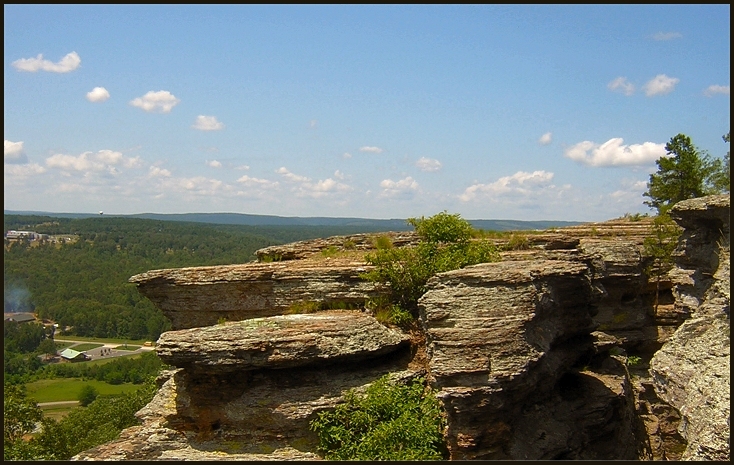 As you can see from the picture it has a three-tiered top-dense woods up to the top, then about forty feet of rock at the summit followed by a crowning cap of dirt with a mini-forest right on top hosting a small series of tiny trails. It was a beautiful hike up the slow descent and an even better climb once I hit the rocks. Pushing up the hills and rocks reminded me of my need to improve my cardio-work and get in better shape. I’ve never climbed through crevices and up boulders like I did on this trip. I had to make some interesting maneuvers once I got to the rock tops that would have made even the happiest of mountain goats a bit envious. Looking straight down through the slits and off the ledges makes one a bit cautious knowing what awaits if your boots miss their next step or you inadvertently move too far left or right. 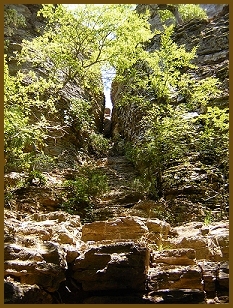 In this shot you can see the approach you have to take to make it to the top of the top. Once on the top of the mountain there was a trail running through a small tree patch that leads to several wide rock platforms jetting out like capped off boulders. The view from there was spectacular and the quiet even more satisfying. ~ by ostrakinos on June 30, 2007. Beautiful! I makes me miss my rock climbing days.